Salad oil is cooking oil that can be used as dressing for a salad, which is exactly where its gets its name, salad oil. In addition to its use in dressing, it can used to make baked goods such as pound cakes, cookies, and muffins as well as in deep frying foods. Some salad oil is said to be primarily consisting of margarine and mayonnaise. 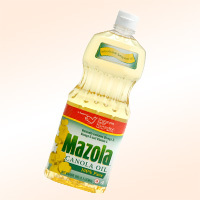 Compared to other cooking oils, salad oil is quite inexpensive. Since it can be made from vegetables, soy beans, sesame, safflower, and sunflowers it doesn't have to follow the strict requirements of pure oils making it cheaper to make. Salad oil has a very limited shelf life due to the fact that it may oxidize faster than other cooking oils. Generally speaking, salad oil is only good within 1 year of being produced. Looking up the best way to preserve salad oil is highly recommended. The calories in Salad Oil per 12g(1tbsp) is 111 calories. Salad Oil is calculated to be 921Cal per 100 grams making 80Cal equivalent to 8.69g with 12g of mostly fat、0g of carbohydrates、0g of protein in 12g while being rich in vitamins and minerals such as Vitamin K and Vitamin E Alpha Tocopherol.